The seven workstreams for Marine Scotland Science’s 10 Year Farm Fish Health Framework are underway, and it will be interesting to see how the first one on Information Flow and Transparency is approached. A concept adopted by some of the salmon farming industry in Tasmania should certainly be considered, that of a “sustainability dashboard” providing information at company, area and individual farm level. Both Huon Aquaculture and Tassal have developed sustainability dashboards, which give varying degrees of information on social and environmental parameters. For Tassal this has resulted from their Aquaculture Stewardship Council (ASC) certification requirements. The ASC certification offers the added advantage that all audit reports are published online and therefore readily available to the public. 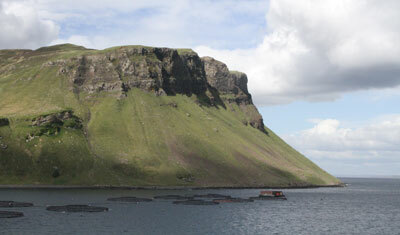 No other certification scheme used in salmon farming does this, and in Scotland it is notoriously difficult to find out which farms are certified by which bodies. The Huon Aquaculture dashboard was created in 2015 to communicate data to their stakeholders, including the general community, others in the industry, community and environmental groups and the media. Both companies still have their critics, however the open availability of their data must help to inform any dialogue with them. Both companies are members of the Global Salmon Initiative (GSI), a body established by several CEOs from the industry with the stated aim to bring about ‘environmental improvement in the salmon aquaculture sector’. It intends to have all its members ASC certified by 2020, and has a sustainability reporting page which gives information on several environmental and social criteria of its members, at company level. While this is useful, it is the company’s own sustainability dashboards and audit reports that provide the most precise data, often to farm level. Best Fishes has conducted a case study of several Scottish salmon farms to assess how accessible and comprehensive environmental data is. Initial findings suggest not very! Look out for our detailed report to be published soon in a follow-up blog.